Happy Friday everyone! I'm so excited for our Spring CAL (crochet-a-long)! They have me thinking of the bright, bold and beautiful colors of Spring! 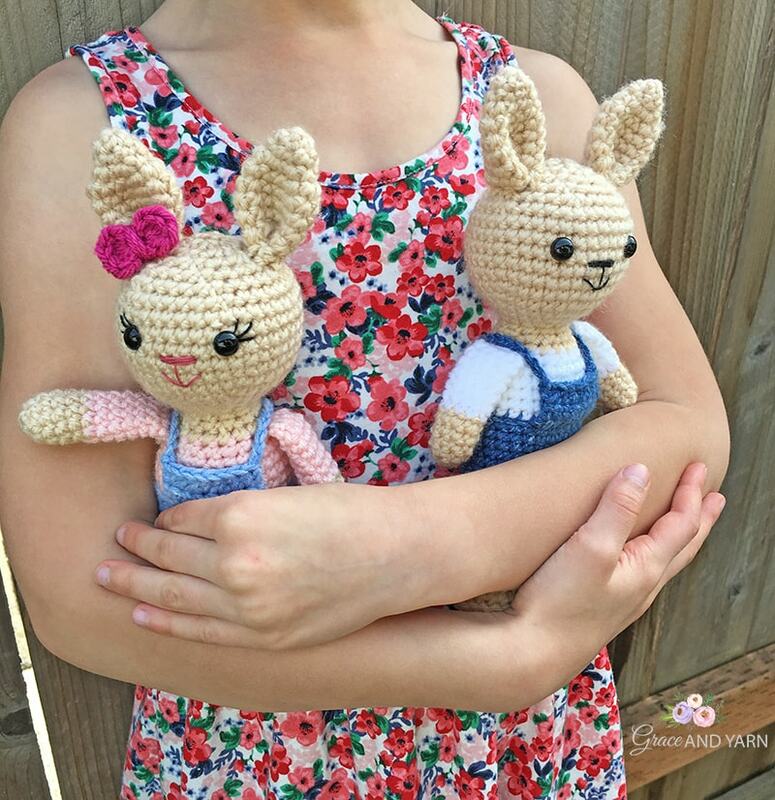 The Berry Patch Bunnies have been one of my favorite patterns to date and when brainstorming for our Spring CAL I knew we had to have a mini version! These wee little ones measure about 8 inches tall, almost half the size of their larger versions. If you missed them last year you can find the girl version here and the boy here! Since they have a nice small size I kept the legs, body and head as one piece. Very similar to the other minis on the blog with the exception of keeping the formed feet. I love the extra detail it adds! Getting the proportions just right for this pattern was fun and frustrating at the same time! It created a challenge that I enjoyed and on the 5th go we had a winner! It's always important to me for your creations to last. The main problem I had was making the head just a little bit bigger to be in proportion with those cute little feet I liked so much. But, by making the head larger it cause the neck to be more wobbly than I'd like. On the 2nd try I widen the neck but the proportions just didn't look right. 3rd try was shorter body, narrow neck and smaller head. Still didn't have it! In the end I kept the neck narrow and went for the middle size on the head. I felt like Goldilocks and cut the increase count in the middle. Whew! It was finally looking right. These are the patterns that I usually end up enjoying the most, even if they were more troublesome than others! Your neck should be nice and strong and last for hours of play. Tight stitches and firm stuffing will help ensure its stability. While I've used a 3.5mm hook for this pattern it's definitely negotiable! Everyone crochets with a different tension and the hook you want to use for amigurumi can vary. If you've made amigurumi before chances are you have your favorite go to hook and are ready! If you're new to amigurumi try a small part to crochet and get a feel for how loose or tight your tension is. Start with the 3.5mm hook (or a similar size if you don't have one on hand), if your stitches are so tight you have trouble getting your hook in you want to go up in size (try half a size at a time until you find what works for you). If your stitches are very loose you will want to go down in size. Tight stitches help your amigurumi to be strong structurally and help reduce the chance of your stuffing showing through. Keep in mind if you do end up using a different size hook your finished bunny may be slightly smaller or bigger depending on the size and your tension. We will make these in 2 parts which I will go over below. While there are set days that each part will be released, you are welcome to crochet at your own pace. There is no date your creation has to be started or finished. Each part will remain on the blog as a free pattern! A CAL is a fun event where a group of crocheters come together and work on each part of the pattern together. This CAL will be split into 2 parts and is FREE here on the blog. The best place is in the Grace and Yarn Crochet Group on Facebook! With everyone being in different time zones and having different schedules everyone will be crocheting at different times. The group atmosphere allows you to share photos, comments, and questions whenever you'd like! While the Facebook group is the easiest place to interact with others participating in the CAL, it's not necessary to join. 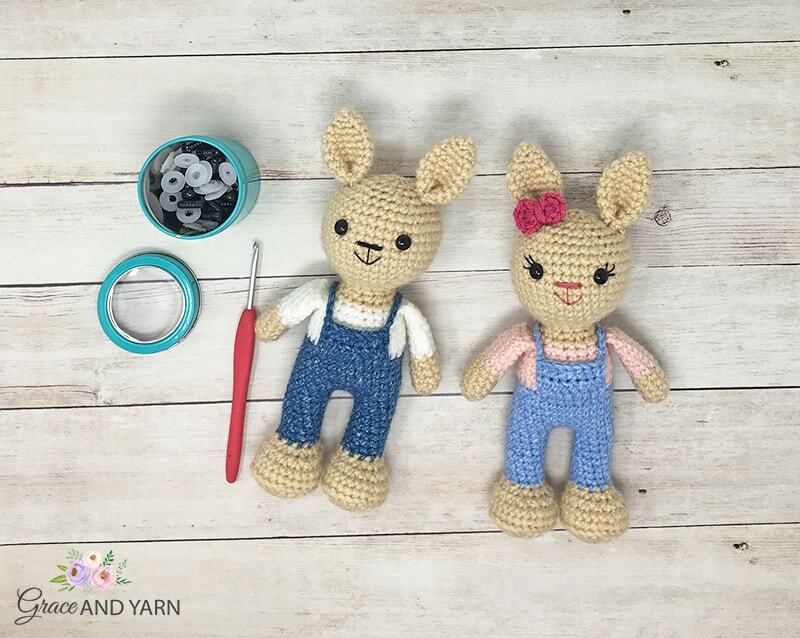 You can also grab a friend to crochet each part together or work on your own as well. If you prefer to work with an ad-free printable PDF version, one will be available in my Etsy and Ravelry shop starting on April 5th! How do I find each part? Each part will have it's own post here on the blog! I will hyperlink each part below in this post, so feel free to PIN it here to save to your crochet board! Each link will also be shared on the Grace and Yarn Facebook page and group page. If you'd like the link sent straight to your inbox, you can sign up for my newsletter here! I'll also keep you updated when new patterns are released so you won't miss them! When will each part be posted? The CAL will start on Friday April 5th and will have 2 parts. If you are new to amigurumi, this is a great pattern to work on. I will break down each step and provide helpful photos along the way. Feel free to ask questions at any time! 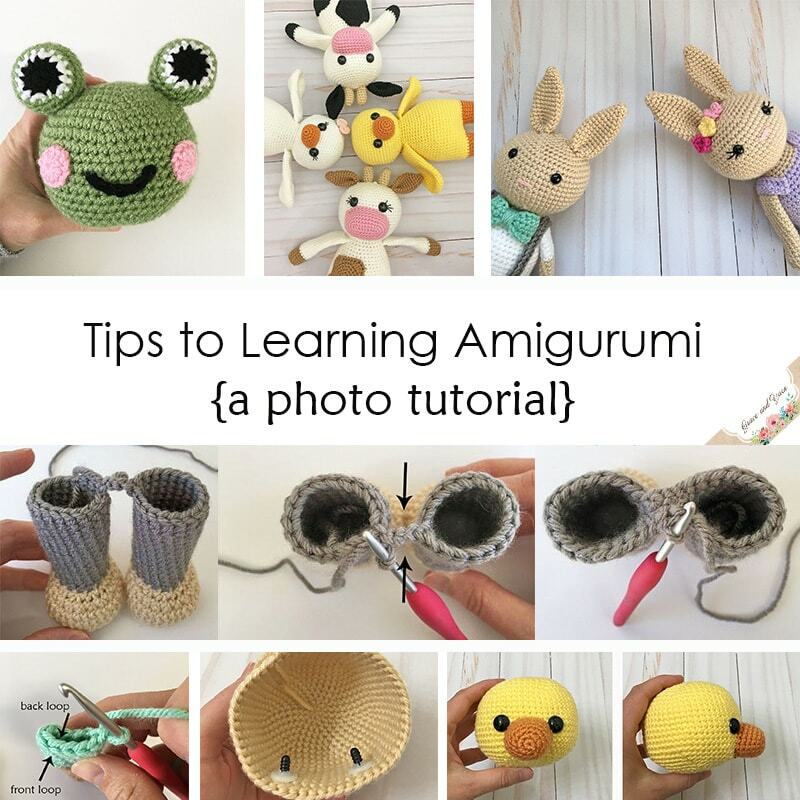 Be sure to check out the Tips to Learning Amigurumi page as it will go over color changes, making magic circles and other tips to get you started! If you'd prefer, you can use crocheted eyes as an alternative to the plastic safety eyes. You're finished mini bunny will measure about 8 inches tall, perfect size for cuddling! This post contains affiliate links, please click here for more information. Thank you for supporting Grace and Yarn! Now the fun part, picking out your colors! Once you have them ready share a picture or comment with us in the group! I'll see you back next week for Part 1!